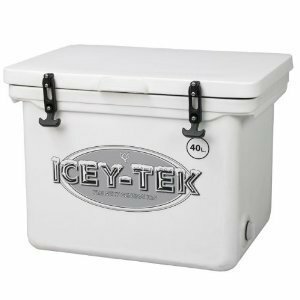 The Icey-Tek 40 Quart Cube Box Cooler is a great new product that features the same high-quality construction that this company is famous for. It is heavy duty, easy to clean and it keeps food colder longer than other models that are the same capacity. These coolers are made with cutting edge materials; advanced manufacturing techniques ensure these coolers are designed to withstand the test of time. The feature most people notice first about an Icey-Tek cooler is its rugged construction. These coolers are made of thick, heavy-duty polyethylene which is almost indestructible. The hinges are welded directly onto the cooler and the lid. This means that you do not need to worry about the screws rusting and coming loose. These coolers are heavier and more ruggedly designed than most other consumer models. They can be used effectively for personal or commercial use. If you buy one of these coolers you will not need to replace it anytime soon. Icey-Tek coolers are all designed to maximize the amount of time they can keep things cool. This superior level of ice retention is made possible due to high quality, medium density, pressurized foam that is injected into the cavities in the walls and lid of this cooler. This space age insulation is the key to understanding what allows these coolers to stay so cold for so long. As with any cooler, the fewer times you open and close the lid, the higher the level of performance you will be able to achieve. The material that the Icey-Tek coolers are made from is the same material used to produce commercial cutting boards. The coolers contain exterior surfaces that are easy to wipe clean. The exterior is molded to form a thick, uniform, polyethylene exterior surface. The interior contains a non-odor absorbing, non-staining, impact resistant, commercial-grade food liner. There are two small drain holes in the bottom of the cooler to make it easier to empty. It will keep your food cool and is easy to clean afterward. It features a 40-quart interior storage volume. The weight of this cooler is 17 pounds. The interior has a commercial quality food-grade interior liner. The interior surfaces are non-staining and odor-resistant. The exterior features a heavy duty insulated wall and lid to help maintain temperature longer. This cooler includes an attached handle for lifting the lid. The welded hinges are designed to prevent the lid from falling closed unexpectedly. Premium latches made of silicone will keep your cooler tightly secured. Two drainage holes in the bottom allow for ease of cleaning. This cooler features a lockable lid for added security. Most customers listed the Icey-Tek cooler’s ability to keep ice and food colder longer than other coolers as the primary reason they selected this product. Customers who made the Icey-Tek purchase all seem satisfied with the performance they receive from these coolers. The number one complaint mentioned by most customers is the cost of the Icey-Tek coolers. In many cases, the cost alone was enough to make customers choose another model. Those that selected an Icey-Tek cooler instead were pleased with the purchase they made. Icey-Tek coolers are more expensive than most competitor models, but they are much more rugged and heavy-duty so they justify the additional cost. We are as confident as customers are that the Icey-Tek cooler is a good investment that will last you for years to come. This is an excellent product for any fisherman or outdoor enthusiast. It is rugged enough to endure even the harshest outdoor conditions. It keeps food cool and prevents ice from melting for a long period of time. This cooler is perfect for placing your catch in when fishing. It is also the ideal way to keep food cold longer if you are out camping. What should be obvious from this Icey-Tek cooler review is that it is the ideal choice for anyone who enjoys the great outdoors. These super high-efficiency coolers are very heavy duty and they are designed to keep food and drinks cold for hours. Most people, who are looking for a cooler to use around the house to keep ice in for parties or drinks cold by the pool, will not need an Icey-Tek cooler. If this is all you are looking for, you should save your money and invest in a lighter-weight model that will perform just as well around the house. The Icey-Tek 40 Quart Box Cooler is designed to keep food cold for longer than other coolers. Its design is rugged so it can hold up to the stresses of an outdoor environment. These are long-lasting durable coolers that receive extremely high customer satisfaction reviews. This is a company you can trust to deliver a high-value product every time.